Parents of anti-Christmas protesters calling themselves “Losers with Women” have expressed their delight at getting their sons out of the house for a few hours. 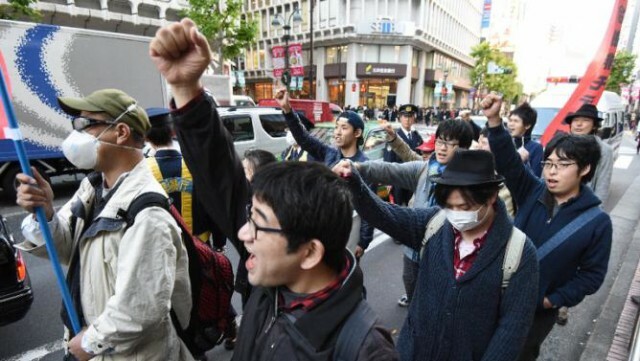 The group of about 20 men demonstrated throughout Tokyo denouncing the upcoming holiday as a capitalist ruse against singletons. “I’m just so thankful Kenji came out of his room long enough so I could clean it,” said one parent. Many of the protesters shouted slogans and held up signs condemning the festive season. “I’m so proud of little Satoshi for attempting to hand write,” Mrs. Suzuki said of her 45-year-old son. Single women in the area could hear some ruckus but the group of men remained largely invisible.